VATICAN CITY (CNS) — Catholic legislators must defend religious freedom around the globe, but they must take care to ensure they do not fall into the trap of showing disrespect toward or intolerance of other religions while doing so, Pope Francis said. 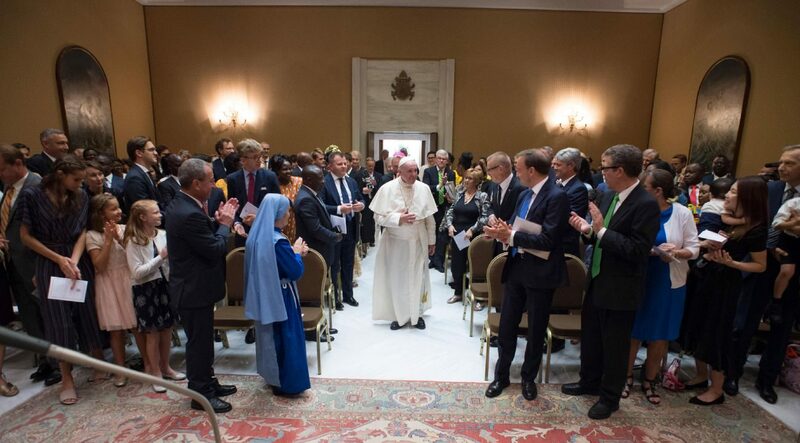 Pope Francis told participants that the Christian politician is called “to try, with humility and courage, to be a witness” to Christian values and to propose and support legislation in line with a Christian vision of society and of the human person. The situation of Christians and other religious minorities in some parts of the world has “tragically worsened” due to “intolerant, aggressive and violent positions” even in countries that claim to recognize the freedom of religion, he said. While defending religious freedom is part of the obligation to promote the common good, Pope Francis cautioned the legislators about the rhetoric and actions they use to do so. There is “the real danger of combating extremism and intolerance with just as much extremism and intolerance, including in attitudes and words,” he said.